to greet you personally, but I trust you've found everything you needed. Jonathan Harker arrives at the castle of Count Dracula near Klausenberg, posing as a librarian. He is startled inside the castle by a young woman begging for help, claiming to be a prisoner. Dracula then greets Harker and guides him to his room, where he locks him in. Jonathan starts to write in his diary, and his true intentions are revealed: he has come to kill Dracula. Freed sometime later, Harker again is confronted by the desperate woman. She begs him for help but then bites his neck. Just as she does, Dracula arrives and yanks her away. When he awakens in daylight, Harker finds the bite mark. He hides his journal in a Virgin Mary grotto outside the castle and descends into the crypts, where he finds Dracula and the unnamed woman in their coffins. Armed with a stake, he impales the woman. But when he turns to kill Dracula, the count has already awakened and is waiting for him. Dr. Van Helsing then arrives in Klausenberg, looking for Harker. The frightened townsfolk give him Harker's journal. When he arrives at the castle, it is deserted; a hearse carriage speeds by with a coffin in it. In the crypt, Van Helsing is horrified to discover Harker lying in a coffin as a vampire. Staking Harker, he leaves to deliver the veiled news of Harker's death in person to a wary Arthur Holmwood and his wife Mina, brother and sister-in-law of Harker's fiancée Lucy Holmwood. Lucy is ill, so the news is kept from her. But, when night falls, Lucy opens the doors to her terrace and lays bare her neck — already, it bares the mark of a vampire bite. And soon Dracula arrives and bites her again. Mina seeks out Van Helsing's aid in treating Lucy's worsened health, but Lucy defeats his anti-vampire prescription, and Lucy dies. Van Helsing turns over Harker's journal and reveals the truth. Vampire Lucy lures away a young niece, but the girl is saved by Van Helsing and Arthur. Arthur refuses to use Lucy as a means to find Dracula, so Van Helsing stakes Lucy in her coffin. Van Helsing and Arthur travel to the customs house in Ingstadt to track down the destination of Dracula's coffin (which Van Helsing saw carried away when he arrived at Dracula's castle). Meanwhile, Mina is called away from home by a message telling her to meet Arthur at an address in Karlstadt — the same address Arthur and Van Helsing are told the coffin was bound for — and Dracula is indeed waiting for her. The next morning, Arthur and Van Helsing find Mina in a strange state. They leave for the address they were given, an undertaker's, but find the coffin missing. When the decide to set off again, Arthur tries to give Mina a cross to wear, but it burns her. 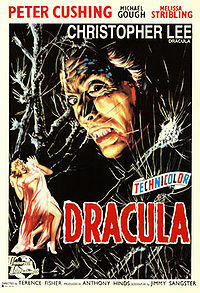 During the night, Van Helsing and Arthur guard Mina's windows outside against a return of Dracula, but Dracula nonetheless appears inside the house and bites her. A remark by the maid leads Van Helsing to the coffin's location: the cellar of the Holmwoods' own house. But Dracula is not in the coffin and instead escapes into the night with Mina. A chase then begins as Dracula rushes to return to his castle near Klausenberg before sunrise. He attempts to bury Mina alive outside the crypts but is caught by Van Helsing and Arthur. Inside the castle, Van Helsing and Dracula struggle. Van Helsing tears open the curtain to let in the sunlight and, forming a cross of candlesticks, he forces Dracula into it. Dracula crumbles into dust as Van Helsing watches in horror. Mina recovers, the cross-shaped scar fading from her hand as Dracula's ashes blow away and leave only a ring behind.